I was hoping for this article to be out before their ACL game today, but life got in the way as it stubbornly tends to do. Also, WordPress ate up my post again (that’s it. I’m typing it in Word and then pasting it here when done.) so for that, Mianhaeyo. The runaway favorite, the powerhouse, the Green Machine. For the second year in a row, Jeonbuk Hyundai Motors are heavily tipped to hoist their K League crown once again. But why is that? And does any team have what it takes to challenge Choi Kang-Hee’s side for the 2015 title? City: Jeonju, North Jeolla Province (Jeonju is the capital of North Jeolla Province). The Jeonju Castle turned green and black in the 2006 AFC Champions League final. The K League recognizes the Jeonbuk Hyundai Motors franchise beginning on December 12th, 1994. We’ll get to that date in a sec, but for one reason or another, they’ve chosen to ignore the first year of football in Jeonbuk Province. In 1993, Wansan Puma FC was founded by a businessman, Oh Hyung-Kun, but he didn’t raise enough funds to keep the club running. But an alcohol company saved the day, as Bobae Ltd. took over the club for a year. However, Jeonbuk’s first year in the top flight was lackluster, finishing underneath Jeolla rivals Jeonnam. Then, Hyundai Motors came in, and took control of the club. Despite their big-name owner, Jeonbuk never got the results, other than a couple FA Cups. That is until Choi Kang-Hee became their new boss. That vow has long been broken however, because even his haters have got to admit – he’s been the savior for the Jeonbuk franchise. Since he became manager, Jeonbuk have won 3 League titles, an FA Cup and an Asian Champions League. Quite a feat. Jeonbuk were simply unstoppable last year. Only three times did they fall out of the top two spots at the end of the round, and after Round 18 – with 20 rounds till to go – Jeonbuk never fell out of pole position. Why is that? What can that success be attributed to? Was it the resurgence of their dominant midfield? Was it the return of the Lion King Lee Dong-Gook? Was it Choi Kang-Hee’s gegenpressing-then-long-ball-it-because-without-long-balls-it’s-not-Choi-Kang–Hee system? The easy answer: all of these factors. It was a perfect storm for Jeonbuk last year, as they never looked back to claim the title. Jeonbuk have been rather busy in the window for defending champions, but in the end I reckon they’ve done more to strengthen their squad then lose key players. The biggest loss will probably be Lee Seung-Gi, who played on the left wing but can also play the middle as a #10. He’s been capped for the KNT and could feature in the future. However, Lee has had to take off the Jeonbuk green and instead wear the white and red stripes of Sangju Sangmu to fulfill his military duties. However, the North Jeolla side have replaced him with Lee Ho, a talented, former Zenit St. Petersburg player. Also on his way out is defensive midfielder Shin Hyung-Min, to the Police force at Ansan Police. But the transfers in are so compelling. Edu, formerly of Schalke, and Eninho, a club legend coming back for a second stint with the Green Machine. In fact, Eninho is a member of the 40-40 club – 40 goals and 40 assists in the K League. Also keep an eye on youth prospect Moon Sang Yoon who joined the exodus of fleeing Incheon players. Jeonbuk Hyundai Motors, however, already had an excellent core of players before these transfers. It would be a crime to not mention Lee Dong-Gook – the Lion King as he’s known. Sure, he’s 36 years old, he’s getting on in terms of age, but although he may be less mobile than in times past, he is a reliable finisher. His specialty – volleys. Jeonbuk also have KNT left winger Han Kyo-Won among their ranks. He is more of an out-and-out traditional winger that really offers width, although he was used in a more defensive capacity under Stielike Korea at the 2015 Asian Cup. Their midfield was superb last year, tactically aware (as you need to be when your game is constantly focused on pressing the ball carrier and his passing options) and delightfully cohesive. And in defense, Alex Wilkinson, who comes back to Korea with an Asian Cup gold medal around his neck (damn you! ), is a key centre-back for Jeonbuk. He will be working with a new partner though. (Although he appears to be injured.) Jeonbuk also boast depth in central defense with Kim Ki-Hee. Ok so if you haven’t figured it out by now, or are a newcomer to the KNT (I doubt it, if you’re reading these lines, but whatever) Choi Kang-Hee was the Korean national team manager between 2011-2013, taking over the Korean national team after the KFA pushed the panic button and dismissed Cho Kwang-Rae with a game left in the penultimate round of AFC Qualifying for the 2014 FIFA World Cup Brazil. Choi was selected for his success in the K League, but he didn’t really want the job. His contract lasted until June 2013, after which, the KFA would appoint a new successor for the World Cup (Hong Myung-Bo). Choi’s know-how in the K League, however, didn’t amount to much in Asia. His squad selections were flawed (remember that game vs Iran? a 4-4-2 with 1 actual midfielder), he had a public falling-out with now-KNT captain Ki Sung-Yueng and his system. Oh, god. It was sometimes awful. All the KNT did with Choi was play extremely directly, punt the ball down the pitch that would make a field goal kicker envious and then hope to win the lottery and score a lucky goal. My, my, how dare you insult my tactics (or lack thereof)? Jeonbuk have the easiest Asian Champions League group of the four Korean qualifiers. It’s so devoid in quality compared to the others, Jeonbuk should have a cakewalk. Kashiwa Reysol are hardly the best team in Japan, and as was demonstrated by lowly Seongnam’s win today over Japanese treble holder Gamba Osaka, J.League teams don’t seem to show up for ACL games, certainly not on the road. And yet, Kashiwa should be qualifying in Jeonbuk’s shadow, as Shandong Luneng Taishan aren’t exactly feared, while Becamex Binh Duong, all due respect, are a Vietnamese side who will gain experience but probably nothing more than a good ol’ whopping in most games they play. Can the Jeonbuk captain, the Lion King, Lee Dong-Gook lead Jeonbuk to two consecutive league titles, something that hasn’t been done since 2003? The league title is Jeonbuk’s to lose. They can only build on last years’ successes and have had excellent pre-season training out in Dubai. They have added depth players, and good ones at that. There’s no need to change their system – why fix something if it ain’t broken? – and thus Choi Kang-Hee is far ahead in his team building than say Yoon Jung-Hwan or Choi Yong-Soo (with his new system). If I had to pick one Korean team to win the AFC Champions League and the K League, my money would be on Jeonbuk. They are a well-oiled Green Machine, and they get the results. 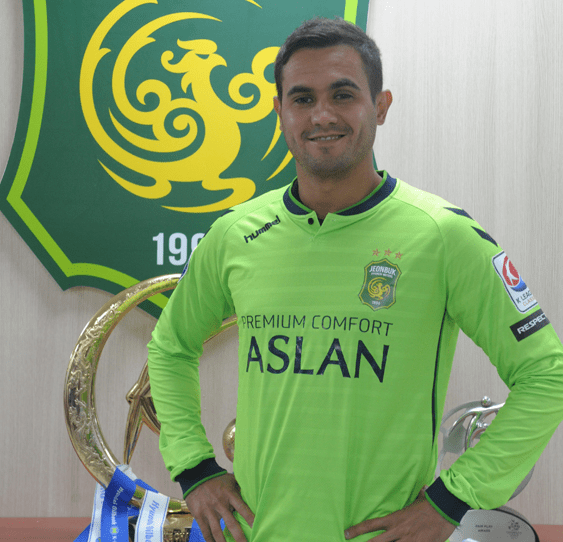 With a bit of luck in Asia, the sky’s the limit to Jeonbuk Hyundai Motors’ 2015 season. K LEAGUE RANK: CHAMPIONS! <– I feel confident about this one. Naturally, that means that Daejeon are going to win this year and Jeonbuk will be relegated. Aah, predictions. Hmmm, moving on. ACL EXIT: Semi-Finals, but could be worse, could be better. It’s a prediction. It’s never right. Ever. All times KST. Does not include R34-R38 of the K League Classic (after the split), promotion/relegation playoffs, Asian Champions League KO stages, KFA Cup games or the FIFA Club World Cup. Umm, so today’s Tuesday. Tomorrow’s Wednesday, where I was planning on doing the two United teams (Incheon and Jeju), but I feel like I have more to say in one post on Incheon than devoid-of-information Jeju and boring Busan. (Sorry Jae. I don’t mean that.) We’ll see what sings to me tomorrow (it’s a French expression that’s badly translated). Maybe I’ll have a post on the new kits just for fun. I dunno. Jalgayo from the TSC for now. Oh, and if you like these articles, don’t forget to subscribe to the Tavern – yes, you can do that, we’re not on YouTube, but on the right column, you can get every new fantastically awesome post in your inbox. And follow Roy on twitter (which is the de facto Tavern twitter) @taeguk_warrior and myself (Tim) @korfan12. And… yeah. That’s it. Thanks for reading the Tavern of the Taeguk Warriors, the world’s premier English-language blog on Korean football (am I boasting too much? Probably) and stick around! Sorry Tim, got to nitpick and complain a little. 1) Shame on you for not mentioning Lee Jae-sung as a player to watch! Wonderful center mid who should be in the next KNT squad in my opinion. 3) This isn’t necessarily at you, but since you wrote it here . . . I don’t see why people continue to use ‘long-ball’ or ‘direct’ like it’s a dirty word. Granted it’s not the most tactically complex or aesthetically pleasing style of play, but there’s certainly nothing wrong with it. As far as Jeonbuk/Choi goes, I think he realizes he doesn’t have the players to play a short-passing game, so he goes with what works. The team is well-suited to playing a more direct style as their wide players are more direct in nature and as you said Lee DG isn’t particularly mobile anyway. No, no, by any means, go ahead and nitpick. Constructive criticism is what I was looking for, among other things, in doing this series. 2) Grr. My bad. I knew that. 3) But we had the players to do something other than hoof the ball with Choi in the KNT (but I don’t want to bring up this debate/discussion again), which is why I refer to that negatively. With Jeonbuk, I obviously take a few jabs at Choi, as I’m inclined to do, but I don’t have qualms with their direct system when it makes sense. but why can’t we see a kleague club incorporate a versatile style of play in the way (idk just name dropping randomly in the mix) Swansea does running against the grain for ‘recently’ (as of 2011) promoted clubs? On the brink of elimination from the football league a decade ago, they reconfigured their club to play less direct and physical, opting for passing / flowing game. New nickname: swanselona. Since promotion to top flight, Monk has adjusted accordingly, and now they can be a bit more direct when the occasion calls for it, but compared to Stoke – they are Barcelona-esque – possession wise. There’s a number of reasons I’m not in Jeonbuk’s camp, CKH and his direct football approach is one of them. Results -sure, but eye pleasing beautiful football? I don’t believe that to be the case. CKH can win the Kleague but can that translate to overall continental success? I have no idea how much you rate Asian Champions League but Jeonbuk did reach 2011 ACL final. Isn’t that continental success? I may be a bit harsh but since they didn’t win it all in 2011, 2nd in Asia doesn’t cut it. That said, I openly admit to being very partisan against Jeonbuk. Still, FC Seoul came close but runners up in 2013 in the 2 leg final format vs Evergrande, followed by a semifinal knockout by W.Sydney in 2014, now there’s a team that just doesn’t have enough to cross the finish line. I admit I know absolutely nothing about Jeonbuk. I openly dislike CKH (how he handle Ki & his time at KNT interim manager). That said, what’s the difference between CKH’s direct/longball approach to that of say Atletico Madrid (another physical, direct, and “longball” team)? ah, Atletico…I kinda like their fiery manager Diego Simeone, or at least I like his feistiness. However, outside of the CL Finals last May, I’ve not watched them a whole lot – but I have heard that is their style this season (maybe it’s been the Simeone way all along?) – physical/direct where a Diego Costa-like player could be of service. I’m not saying there isn’t a place for direct football, it works for some clubs. I guess I’m wishing for a K-league team with a more versatile approach – something that apparently is not happening atm -as Jae points out from his observations, there isn’t the personnel to do this and maybe b/c past ACL experience shows there may not be an incentive to vary that approach. My crazy hypothesis would then be: IF a K-league club could incorporate and effectively manage varied style & tactics (with trained personnel) THEN it could do better than Jeonbuk’s direct style – and would crush the k-league – knock it and the ACL out of the park. Could I be wrong? hell yes. But I think it’s worth a try. Beauty is in the eye of the beholder Roy. Personally I don’t have any trouble watching Jeonbuk, and think they’re one of the more entertaining sides in the league. I would also argue that no Korean team (not Suwon or Pohang) really plays a passing game simply because no team has the players to do so (there’s a reason why Ki SY is so invaluable). And Choi KH has continental success. If you won’t count the 2011 finals appearance, then there is 2006 when they won it. Personally I also think that when it comes to the continent, physical/aggressive/direct play is more effective (see the J League teams). Can Jeonbuk be more balanced? Sure, but it’s not something that happens overnight. You mentioned Swansea and Monk. Swansea already had the passing/possession part together from years of development. Monk is adding a new aspect now. The same could be said for Barcelona and Enrique. It’s worth remembering that Choi’s current tenure is just a 1 1/2 years old. The first was re-gaining their defensive solidarity. The second was to gain consistency, which they did. Perhaps he’ll work on it this year. But frankly I see little reason to really alter the style. Damn you and your accurate facts Jae!! Jeonbuk 2006 ACL champs…yes, well, um, maybe I can twist this around, wear a different hat and in a Fox New-esque / nutty right wing sort of way say: It’s all an orchestrated hoax, Jeonbuk never won the ACL and the liberal media with all their ‘facts’ will never convince me that it happened! That and Benghazi was a cover up and speaking of other media contrived hoaxes, so is the myth of global warming (which btw gop senator James Infohe from Oklahoma actually believes to a be hoax made by the weather channel. Get this, he’s the new chairman of the Senate Environmental Committee. Thanks US voters who didn’t bother to come out for the midterms!) Hey, opportunity here, maybe I can get the Koch brothers to sponsor a new sort of Tavern…a rightwing leaning Tavern where facts won’t get in the way of rewriting football history to show ‘Merica has the greatest soccer program in the world.